The Cosco Scenera Car Seat is simply a smarter chair – designed for families who know what they need. It keeps kids safer with Side Impact Protection built into the headrest and a five-point harness that adjusts easily from the front of the seat. The harness on this Cosco baby car seat features five heights and three buckle locations so you can be sure you’re giving the best fit to your growing child. If your chosen vehicle happens to be an airplane, the Scenera NEXT has got you covered. Certified for use on aircraft, this NEXT lightweight car seat gives your child a familiar place during the flight. The lightweight and compact design also gets you through the airport without weighing you down. With kids in the car, messes happen. Now, thanks to the easy-to-clean car seat pad, there’s no need to stress. The pad comes in a wide range of styles and colors, all of which remove from the seat and are both machine washable and dryer safe. There’s also no more scrubbing goopy build-up from inside the cup holder; it’s dishwasher safe. This car seat is not only Economical but extremely versatile! Allowing for 3 to fit in the Back Seat! Light Weight and Durable and ready for all the adventures your family will go on. To Purchase you can find this car seat at Walmart here. 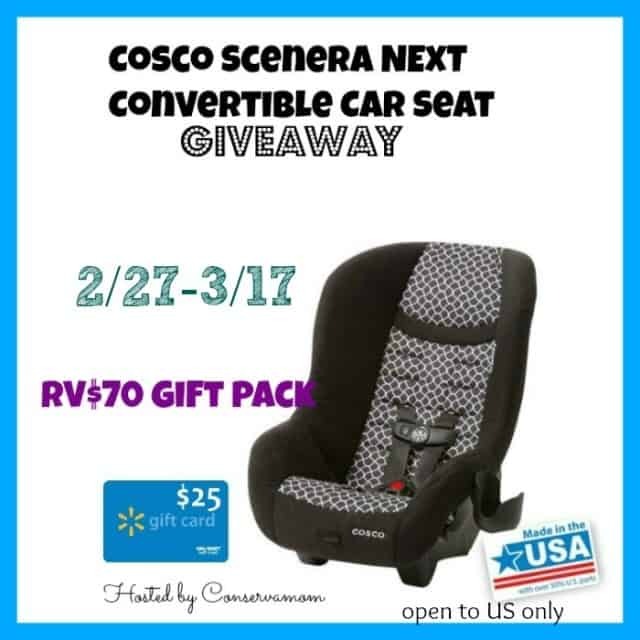 To find out more about this fantastic car seat head over to Conservamom’s Page for her review of the Cosco Scenera.